Sennheiser’s new wireless RS 175 Headphones provide excellent sound quality and they contain several features and surprises that aren’t obvious at first glance. These headphones are primarily for personal use with your home entertainment center. When connected to your TV, they provide great sound wirelessly with two levels of surround sound simulation as well as a bass accentuation setting. The explosions in your favorite movies and TV shows will be even more realistic and percussive. A bonus feature: the volume of the headphones can be adjusted independently of your TV when you use the audio-out port. The sports fan in your family can watch using the headphones while the rest of the room remains silent. If a member of the family has a hearing deficiency, they can use the headphones at a higher volume level than the sound coming from the TV’s speakers. The closed, over-the-ear earpieces are very large, but comfortable even for extended listening. Each earpiece contains a NiMH rechargeable AAA battery. The headphones rest on a base unit that serves as the charger. 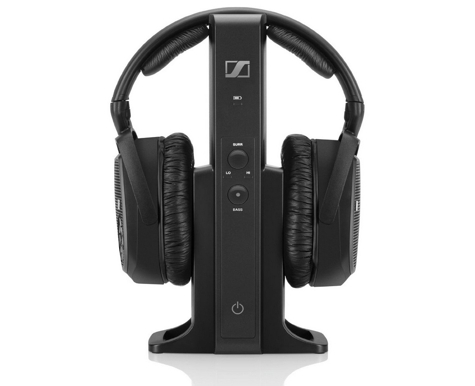 Sennheiser says that a full charge will yield eighteen hours of use. I can’t imagine listening to headphones for that amount of time, but suffice to say you’ll have plenty of power. There is the usual 3.5mm analog audio input in the base unit. A first for me, is a digital (optical) input as well. Finally, you can experience a totally digital wireless audio signal. The transmission from the base unit to the headphones isn’t some wimpy Bluetooth signal, the range on the RS 175 is over 300 feet (100m) line-of-sight. This range will be reduced a bit if there are heavy masonry walls or metal obstructions in the way. I can walk anywhere in our house, including out on the patio, with no signal interruptions. This is truly impressive. Because there are two inputs in the base unit, you can have your TV and an audio source connected simultaneously. There is a switch on the base for toggling between the two. The base unit has two controls, a bass enhancer button and a two-level virtual surround sound button. The former magnifies the bass and latter invokes small amounts of reverberation. The right earphone has the same controls so adjustment can be accomplished on either. There are volume up/down buttons on the right earpiece as well. The cluster of four buttons on the right earpiece aren’t distinguishable by touch. I’d like to see, or be able to feel, a difference among them for ease of use. After using these headphones for a while, you get used to which button is which, but tactile differentiation would have been useful. The package includes the headphones, the transmitter base, two NiMH rechargeable batteries, a 1.5m optical digital cable, a 2m stereo audio cable with 3.5mm plugs, and a power supply with interchangeable multi-country adapter tips (US, EU, UK, AU). The base unit will support two headsets simultaneously. You can purchase a second headset for this purpose. Another nice feature: the ear cushions are replaceable. Over time these can become worn or dirty. Soon, you will be able to order replacements from Sennheiser as you can for their other headphone models. The sound quality is very impressive. I’m fussy about my music and the RS 175 headphones don’t disappoint. The highs are clean and clear, the mid-tones are well defined, and the bass response is robust. If you enjoy teeth rattling, sub-woofer bass, there is a button specifically for that. The virtual surround sound can be set to Off, Low, or High. For music, I usually leave it off, but I discovered to my surprise that some live-concert recordings sound pretty good with the addition of a bit of surround sound. TV/DVD sound requires some experimenting as digital/analog media sources vary widely. Having the controls on the headset makes experimenting easy. 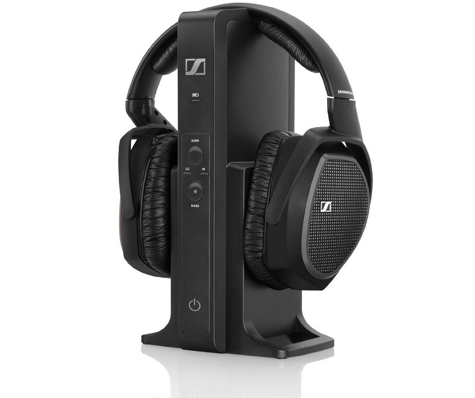 The Sennheiser RS 175 is not just a pair of headphones. The unit is pricy, but it can be a valuable addition to your entertainment center. Sennheiser includes a two-year warrantee. Being able to watch TV with the sound adjusted to your personal tastes needs to be experienced to be fully appreciated, but listening to music is where these wireless headphones shine.